A new housing development for South Shropshire Housing Association was completed in the Autumn of 2014. 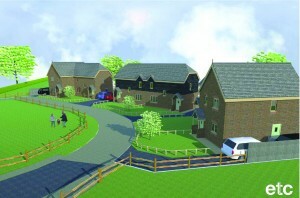 The scheme consists of 6 houses set in stunning countryside, with views over the Shropshire Plains. The homes were all built to Code 3 regulations. The code for sustainable homes is the national standard for the sustainable design and construction of new homes. It aims to reduce carbon emissions and promote higher standards of sustainable design above the current minimum standards set out by the building regulations.